Although roses are impressive when given as a gift, very few flowers can match the beauty and sophistication of Phalaenopsis. Long after the roses have wilted away, these beautiful orchids will still be in full bloom. 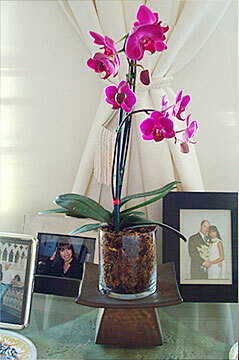 With proper care, the orchid you will receive will last up to three months. Let's see any bouquet of roses try to match that! Beautiful Orchids are pleased to offer you this unique and long lasting way to show that special someone you care. The simplistic beauty of Phalaenopsis' long elegant stems are magnified by the elevation of the ceramic pagoda stand, while the clear glass vase allows them to view the unusual root structure that is not often viewed.